This wine was offered in honor of the Wineberserkers website’s 5th anniversary on Monday, January 27th. That was the day of the Wine Berserker’s annual BerserkerDay. During that day dozens of offers are released one by one directly to the members of the forum. 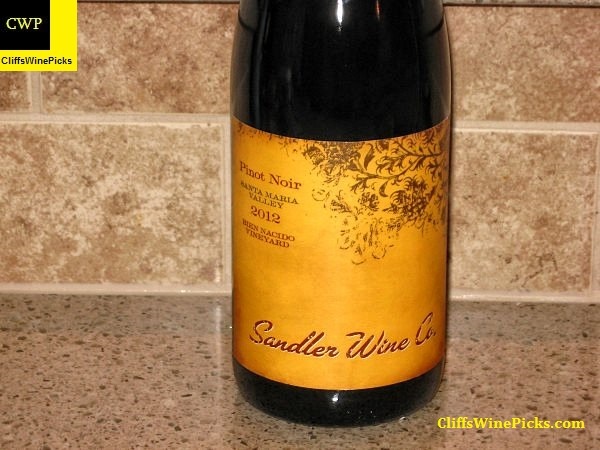 In this case the offer was a 4 pack of different single vineyard Sandler Pinot Noirs. The regular price for the four wines was $152, the special price was $100 with shipping included. It was a killer offer, so I grabbed 2 packages. Besides this wine the other three offered were from the Peterson Vineyard, Boer Vineyard and Keefer Ranch. Sandler wines are produced in San Francisco by owner and winemaker, Ed Kurtzman. Ed’s journey into winemaking began quite by accident, when he took a job at a wine shop during his undergrad studies at UMass Amherst. It wasn’t long before Ed realized that wine was more than a passing fancy. He jettisoned his original career plans, moved to California to sell wine, and soon enrolled in the enology program at Fresno State. After graduating, Ed embarked on an early career that included stints at a who’s who of central coast wineries. He started out in the cellar at Bernardus, under the tutelage of Don Blackburn and Kirby Anderson. Next, he spent three harvests as assistant winemaker to Michael Michaud at Chalone before taking the reins as head winemaker for Rob and Diana Jensen’s Testarossa Winery in Los Gatos. It was at Testarossa that Ed’s deft touch with Pinot Noir and Chardonnay started to gain widespread attention. Before long, he found himself in demand as a consulting winemaker, taking on clients including Fort Ross, Freeman, Roar and Mansfield-Dunne while becoming a partner in August West. In 2003, Ed launched his own label, the Sandler Wine Company, devoted to small bottlings of Pinot Noir, Syrah, Zinfandel and Grenache, from his favorite vineyard and grower sources. More information and access to their mailing list is available by clicking here. 2012 was one of those rare years when perfect spring, summer and fall weather gave the vineyards a healthy crop of high quality and quantity. The last time I saw a year like this was 1997 when I was at Chalone, a long time ago. The 2012 Pinots are already drinking well, and don’t appear to be going into shutdown mode like the 2007s and 2009s did six months after bottling. This 100% Pinot Noir has 13.5% alcohol by volume and the bottle is sealed with an agglomerated cork. WINES THAT RANG OUR BELL IN MARCH 2014 – Our Favorite Wine Writers Share Their Picks – White wines for spring. WHAT’S A GREAT GRENACHE? – Our Friendly Wine Experts Share Their Favorites!